Development of approximately 8,000 square feet of existing spaces within a multi-story medical office building adaptively reused to accommodate a guest waiting area, reception, changing rooms, patient waiting, digital screening rooms, digital mammography rooms, ultrasound rooms, stereotatic room, abvs rooms, tech station, interview room, break area, toilets, reading rooms and storage. The existing mammography department houses screening and diagnostic functions. This project separates screening from diagnostic and provides state-of-the art digital diagnostic mammography equipment in a dedicated suite. In designing the screening and diagnostic suites, improved functionality, efficiency, and convenience were key objectives. 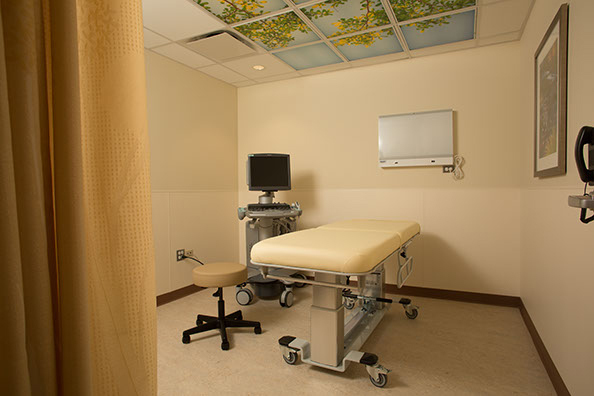 The screening suite's location on the ground floor was selected to increase user convenience. Deliberate disposition of patient, staff and common areas articulates patient and staff spaces and facilitates wayfinding. Finishes were selected to evoke a relaxed and welcoming atmosphere.